Senator Chuck Schumer of New York has proposed Avonte’s Law, a law aimed at helping to track autistic children. The law would create federal funding to help police locate missing autistic children using GPS devices. Bravo Mr. Schumer! What Avonte Oquendo and his family went through is unimaginable, and if there is the ability to prevent even one more family from going through the agony the Oquendo and Fontaine families went through, it should be done. Sen. Schumer said the program would be overseen by the Department Of Justice. The device used to track these special needs children, who very often do wander away from caregivers, would be provided to schools, parents, and non profit groups. 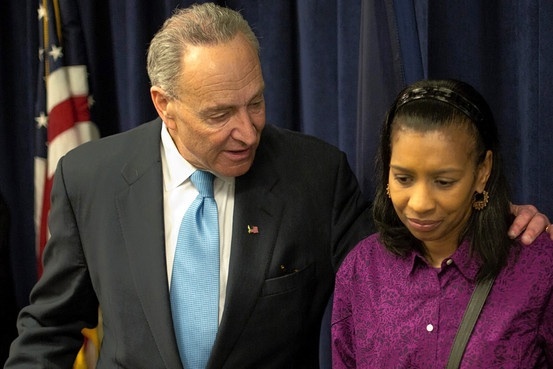 “Avonte’s running away was not an isolated incident” said Senator Schumer. Michael Rosen, vice president of strategic communications at the nonprofit advocacy group Autism Speaks, and the father of a son with autism, said many parents have used the devices privately. Sen. Schumer said he plans to introduce the legislation to the Senate Monday. He thanked the family, who laid Avonte to rest a day earlier, for supporting the bill. “To try to do something positive, which is what they are doing, is saint-like,” Mr. Schumer said. The technology is already in use by law enforcement to find adults suffering from Alzheimer’s, so it is indeed something that works. The most vulnerable in our society need our help and protection. As a parent, I can’t imagine what Vanessa Fontaine is going through. Avonte disappeared from school this past October, and his remains were sadly identified last week. Vanessa Fontaine and Doris McCoy, Avonte’s mother and grandmother, were at the announcement made by Sen. Schumer, but were understandably too upset to speak, according to Perecman. This law and the funding to implement it are very much needed! That is the way to go Senator Schumer and such a fantastic idea ! Hopefully all states will do this to protect special needs children and adults every where. The children become adults with special needs. About ten years ago in our town a disable adult with special needs was killed here by teenage attackers, that attacked him, and he too was like that since childhood. So sad that this world is so wicked like it is and this is such a kind and well needed procedure and endeavor that should be done in all states.